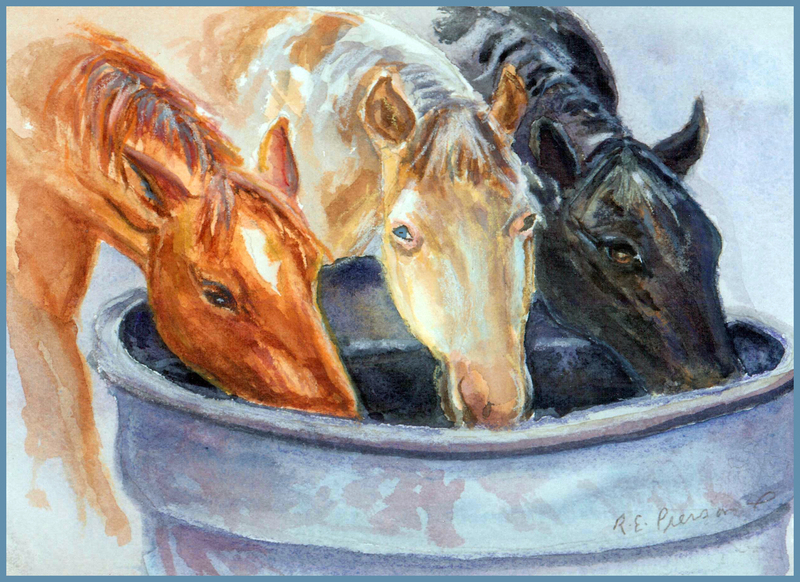 The title of my blog was inspired by a watercolor painting I call Drinking Out of the Trough. I love both the painting and the horses, so I decided to use a slight variation as the title for my book, Drinking from the Trough: A Veterinarian’s Memoir. The painting, by Dr. Robert “Bob” Pierson, was a birthday gift from my wonderful husband, the late Earl Carlson, DVM. Earl commissioned Bob, who was a retired professor of veterinary pathology as well as an artist well-known for his paintings of animals, especially farm animals, to create the painting. Unbeknownst to me, Bob visited our home several times to photograph the horses. The painting is based on those photographs. Hannah’s Dream (we call her “The Baby”) is on the left. She’s an APHA registered paint mare who came to us by way of a friend of Earl’s in Franktown, Colorado. She’s called breeding stock because she’s not painted; she’s a solid red dun. The black horse on the right is Scootsritealong (aka Scooter); he’s a black-and-white APHA registered paint. He is also a gentleman, the term we use for a most well-behaved horse—perhaps surprising, since we purchased him in what can be the worst place to buy a horse: an auction. The beautiful palomino paint mare in the middle is Liberty Sunshine, my Marcie, who was the horse of my life. She was an enormous part of Earl’s and my life, both before our wedding and for almost all of our married life. It’s thanks to Marcie that I am still able to ride today, despite a fractured, and now replaced, hip. I’m still riding thanks to Dr. Douglas Lundy, orthopaedic trauma surgeon; physical therapist Todd Benz; and Dr. Kirk Kindsfater, guru of total joint replacements at the Orthopaedic Center of the Rockies. Ongoing thanks to Pilates and massage therapist Don Spence for bringing my poor ol’ broken body back into shape after each procedure. Note to those who have asked if Bob was still living. He died in December, 2017 at 98. The funeral was in spring. Toddy died three years earlier. May their memories be a blessing.